SUBHEAD: The cries of protesters added to the sense that a hostile takeover was underway. 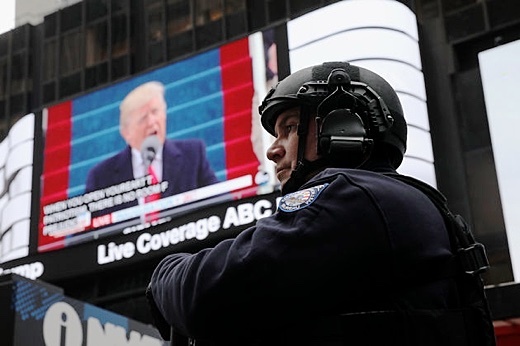 Image above: A policeman, in militarized unitform, stands in Times Square, as a guard during the televised inauguration of Donald Trump as the 45th president of the United States, Jan. 20, 2017, in New York City. From original article. Forgive me, but I love presidential inaugurations. Covering politics and adoring America ― especially our Constitution ― I relish the pageantry of the law-based transition of power, even if I know that we are still not a perfect union. I have covered many inaugurations, and they’ve shared certain reassuring characteristics. The speech allows each new president to start things off on a peaceable note, however urgent the tasks at hand. It’s a chance to pay homage to the constitutional process, to acknowledge those who may not have supported the incoming president during the campaign, to offer soothing words about the durability of freedom. And for the better part of a century, the inaugural speech has allowed new presidents to reaffirm our faith in an active global alliance of free nations for the spread of humanistic values. Well, President Donald J. Trump’s speech offered almost none of that. It was a triumphant day for the new president — but you wouldn’t know it from his angry, conspiratorial address. No one like him has ever been elected, so in one sense, this departure from the norm wasn’t surprising. At the same time, it was a shocking thing to hear and see and feel from a couple hundred feet below the podium. First, the urgency and the anger. Ronald Reagan came to town in 1981 with a good bit of the same attitude. But it wasn’t nearly as pure or simplistic as what Trump expressed in his jeremiad Friday. When Reagan was inaugurated, he made sure to stress that he wasn’t against government per se, or even against Washington, D.C. Rather, he said, he was against wastefulness. Trump, on the other hand, made it personal, even if he didn’t mention any names. And he made ominous allusions that called to mind old European tropes. Who is this “small group?” Does he mean Congress? The wider federal bureaucracy? The K Street lobby corps? The press? Maybe he was talking about the whole churning machine of Washington itself. But something that vast wouldn’t seem to fit the devil-in-hiding liturgy of Trump’s more conspiratorial, xenophobic supporters, led by White House counselor Steve Bannon. Trump’s vehement tone was all the more striking given the relatively small turnout for the event on the Mall ― which was nowhere near as crowded as it had been for some past inaugurations ― and the genial, unthreatening mood of many of his supporters in seats beneath the Capitol’s West Front. Presidents tend not to talk about themselves very much in their inaugural speeches. But Trump, as usual, departed from tradition, and did so in the dramatic, passionate tones of a revolutionary leader. At times, the anti-Washington populism of Trump’s speech ― he indicted much of the very system that had just installed him ― made his predecessors, even Reagan, seem like go-along, get-along types. In fact, rather than simply nodding to the idea of patriotism and love of country, Trump made it the central feature of his vision. The cries of protests wafting up to the West Front added to the sense that a hostile takeover was underway. As inherently American as presidential inaugurations are, no modern president has ever made patriotism per se the central feature of his message. There are two reasons for that. One is that the United States has, since World War II, been part of a global alliance of nations standing for values that are American but that transcend any one nation. The Constitution, not the president, is the boss in America, and it cannot be fired. But unless I missed something in his abattoir of an address, Trump did not mention on Friday who the real boss is.